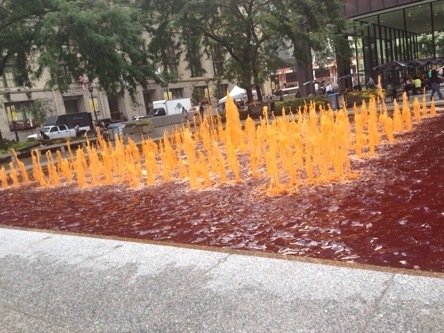 As I was running to catch my train in downtown Chicago today, I came upon a strange but interesting site in Dailey Plaza…..a fountain with orange water spouting out and dark orange pool water at the bottom. I’ve passed by this fountain many times and know that it is not a regular occurrence. Although I was pressed for time, I was intrigued enough by the odd color that I risked missing my train and stopped to snap the photo above. Champagne, More Versatile Than Wine?